Very large emeralds (over 10 cts) of good quality are extremely rare. Most of them are in museums, crown jewels or the jewelry boxes of the elite. Emeralds over 3 cts are even rare, available to average people for thousands of dollars. An emerald of good quality of any size is valuable, though the price will go down significantly when the stone is less than 1/2 carat. In the wholesale gem trade, emeralds are sold on a price per carat basis. Therefore, it would make sense that a 3 carat emerald would cost more than a 1 carat emerald, all else being equal. However, an aditional factor is that it is rarer to find a 3 carat emerald than a 1 carat emerald. Therefore, not only is the total price higher, but the price per carat is also higher because of the added rarity factor.For example, a 1 carat emerald of excellent quality might cost $1000. 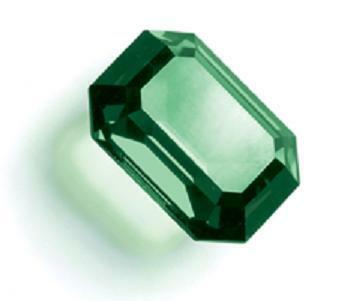 A 3 carat emerald of the same quality would NOT cost $3000 (3 X 1), rather it might cost $8000. Please suggest where to buy an absolutely clear and 6-7 ratti panna. although i have one of 7.5 ratti and its near 27000rs but not satisfied with the quality. what are the key factors in quality and which panna is the best,what color- a bluish green or pure green like coriander(dhania) color. are the rasheas or fine fiber like insertions bad and considered as blemish and effects price?? we wish to have original emerald. please suggest the weight.